We reviewed 28 patients in order to assess the outcome of tuberculosis of the foot and ankle in children and to describe a classification that would relate to prognosis. The median age was 3 years (1 to 12.5 years). The ankle was involved in 13 (46.4%) patients, the midfoot in nine (32.1%), the subtalar joint in five (17.9%) and the calcaneus in one (3.6%). Radiographs of ankle joint involvement showed osteopaenia with or without lytic lesions of the distal tibial epiphysis, sclerosis or lytic lesions of the dome of the talus, or joint space narrowing. Midfoot involvement showed osteopaenia with or without 'absence' of bone (cuneiforms, cuboid and navicular). Subtalar involvement showed lytic lesions of the calcaneus and/or inferior talus that were not always visible on plain radiographs but were confirmed with CT scan in three patients. Open biopsy was done in all patients. Histology and/or culture were positive in 26 of 28 patients. Treatment was with isoniazid, rifampicin and pyrazinamide for 9 months. Two patients had multiple-drug-resistant tuberculosis and their drugs were modified accordingly. At a mean follow-up of 5.9 years (3 to 18 years) no patients had residual symptoms and all except one had a plantigrade foot. Ten patients (35.7%) had an excellent result, 14 patients (50%) a good and four patients (14.3%) had a poor result. Joint space narrowing was a reliable predictor of a poor outcome in the ankle joint (3/9). All patients with midfoot involvement had a good functional outcome, although the joint space was not always definable. One of the five patients with subtalar involvement had a poor result. 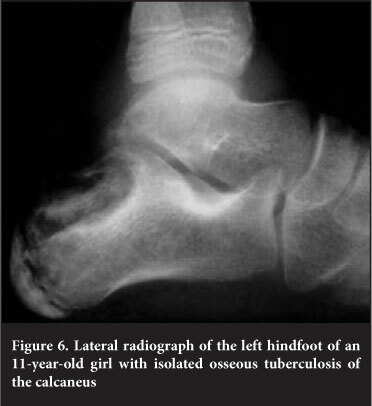 Spine, hip, knee and elbow tuberculosis in children have been reported describing the outcome in relation to the radiological appearance at presentation.4-8 The few reports of foot and ankle tuberculosis mainly involve adult patients9-11 and do not relate to prognosis. 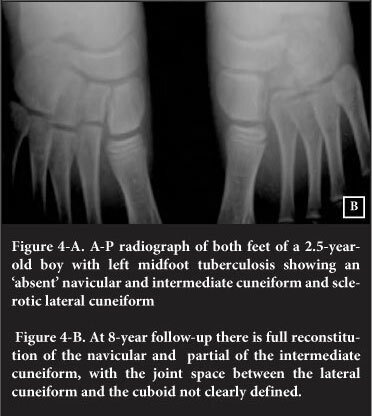 We reviewed 28 children with foot and ankle tuberculosis. The aim of our review was to critically assess the longterm outcome and to define a classification system that would relate to prognosis. 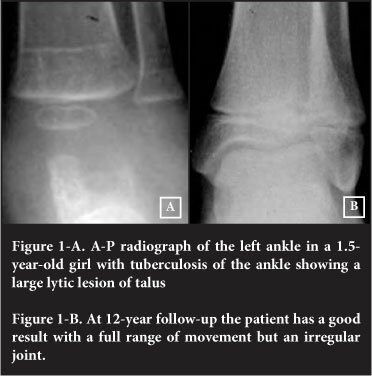 We reviewed the clinical records, operation notes and radiographs of 28 patients treated for tuberculosis of the foot and ankle in the 24-year period from 1982 to 2005. All patients except one was treated and followed up by the senior author (EBH). The median age was 3 years (1.5 to 12.5 years). The ankle joint was involved in 13 (46.4%) patients, the midfoot in nine (32.1%), the subtalar joint in five (17.9%) and the calcaneus in one (3.6%). No patients presented with metatarsal or phalangeal involvement. The median duration of symptoms was 4 months (1 week to 2 years). Ankle joint and midfoot involvement presented with swelling due to synovitis with or without pain. Subtalar joint involvement also presented with a history of stiffness with or without pain; one had a valgus and one a varus deformity. Four patients (two ankle and two midfoot involvement) presented with a sinus due to an abscess that was drained at another institution. One patient with subtalar involvement presented acutely with a warm, red joint mimicking a septic arthritis. We regarded a normal range of movement of the ankle joint as 15° dorsiflexion and 50° plantarflexion and of the subtalar joint as 20° inversion and 5° eversion. Patients with ankle and subtalar joint involvement had a decreased range of movement. Midtarsal movement was not assessed. AP and lateral standing radiographs of the ankle or foot were done at presentation, 3 monthly while on treatment and at final follow-up. The ankle joint showed osteopaenia with or without lytic lesions of the distal tibial epiphysis, and/or lytic or sclerotic lesions of the dome of the talus (Figures 1A and 2A). 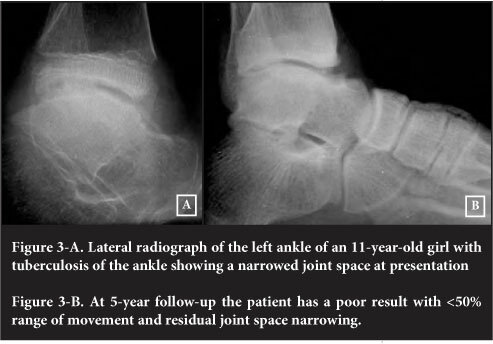 Joint space narrowing was seen in three ankles (Figure 3A). Midfoot involvement showed osteopaenia with 'absence' of bone (cuneiform, cuboid and navicular) (Figure 4A). 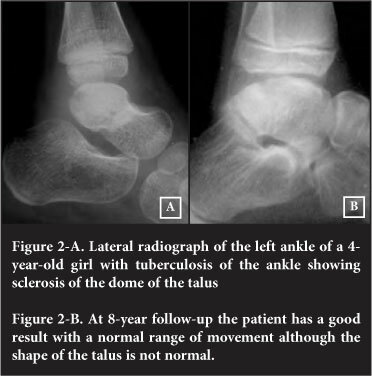 Subtalar involvement showed lytic lesions of calcaneus and/or inferior neck of talus. These lesions were not always visible on plain radiographs but were confirmed with CT scans in three patients (Figure 5A and B). The ESR was elevated (>20 mm/hr) in 22 (78.5%) patients. The Mantoux skin test was positive in 26 (92.8%) patients and chest radiographs showed features of old or active tuberculosis in 13 (46.4%) patients. HIV testing was not done routinely. The patients were treated with rifampicin (10 mg/kg), isoniazid (10 mg/kg) and pyrazinamide (30 mg/kg) for 9 months. Two patients with multiple-drug-resistant disease were treated with the addition of a quinolone, ethionamide and terizidone. Patients were immobilised with a backslab and active mobilisation was permitted as soon as pain allowed. During the 9 months of treatment, radiographs (AP and lateral standing of the ankle or foot) and an ESR were done at 3 monthly intervals to monitor the response to treatment. Weight-bearing was commenced as soon as there were radiographic signs of healing, usually after three months of treatment. All patients were followed up clinically and radiologically for a mean of 5.9 years (range 3-18 yrs). An excellent result was a pain-free, plantigrade foot with a normal range of movement and normal radiographs. A good result had a pain-free, plantigrade foot with ≥50% range of movement and/or some joint irregularity. A poor result had one or more of: pain, deformity, less than 50% range of movement. The results are shown in Table II. At follow-up all patients had no residual symptoms. All had a plantigrade foot, except one patient with subtalar involvement who had a varus foot. Twenty-four (85.7%) of the patients had an excellent or good result. Of the 13 ankle joints, ten had an excellent or good result. Erosions and large lytic lesions (mainly seen in the talus) and sclerosis of the talar dome healed with a good-to-excellent outcome as long as the joint space was normal at presentation (Figures 1B and 2B). The three poor results had joint space narrowing at presentation (Figure 3B). The main radiological feature in the midfoot was osteopaenia with suggestion of destruction ('absence') of the navicular, cuboid and mainly cuneiform bones. This however reconstituted at long-term follow-up. Although the joint spaces were not always clearly defined on radiographs the patients had a good functional outcome (Figure 4B). Four of the five subtalar joints had a good or excellent outcome. The patient with a poor result had a two-year delay to diagnosis, a varus deformity and multi-drug-resistant tuberculosis. The isolated lesion of the calcaneus (the only lesion not involving a joint) had an excellent result (Figure 6). We treat an average of 25 children with skeletal tuberculosis annually. The spine is involved in 15 patients, the knee in five and the hip in four. We treat one patient of tuberculosis of the foot and ankle per year, and one with elbow involvement every second year. Our prevalence of foot and ankle tuberculosis of 4% of skeletal tuberculosis is lower than the 10% reported from India10 and Malaysia.12 In an endemic area the differential diagnosis of a joint in a child with chronic inflammation and synovitis is tuberculosis and juvenile rheumatoid arthritis (JRA). This is especially true in the knee, ankle, subtalar and elbow joint. The hip joint is rarely involved in JRA. The radiological classification of tuberculosis of the knee described by Kerri and Martini13 can be applied to most joints with tuberculosis or chronic inflammatory joint disease. Type 1 is described as 'normal': osteopaenia with or without epiphyseal hypertrophy. Type 2 is 'osteomyelitic': osteopaenia with epiphyseal or metaphyseal erosions with a normal joint space. Type 3 is 'arthritic': joint space narrowing. Type 4 is also 'arthritic': gross anatomic disorganisation of the joint. Ankle involvement could be adequately described by the Kerri and Martini classification, but joint space narrowing in the subtalar joint was difficult to quantify due to the normal overlapping of the talus and calcaneus, and similarly in the midfoot with significant osteopaenia or 'absence' of bones. We do not routinely utilise CT or MRI for diagnosis in hip, knee or elbow tuberculosis. In this study however, in three of the five feet with subtalar involvement, erosions were visible on the CT only. 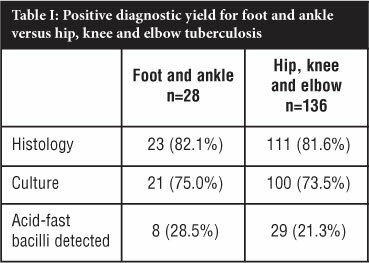 A stiff subtalar joint with or without varus or valgus deformity without visible erosions on plain radiographs warrants a CT.
A positive diagnostic yield (histology and/or culture) in 26 of 28 (92.8%) of patients is gratifying. Our laboratory uses the Lowenstein-Jensen and the automatable radiometric (Bactec) methods for culture. Two children cultured multiple-drug-resistant organisms. These patients were started on routine treatment of rifampicin, isoniazid and pyrazinamide. There was a delay of 4 weeks before the culture result became available and effective treatment could be started. Since 2008 polymerase chain reaction (PCR) is performed if Ziehl-Neelsen staining is positive. This should hopefully speed up the detection of resistant strains. Aspiration has a much lower yield than open biopsy.3 An open biopsy is imperative to differentiate histologically between tuberculosis and JRA, and to obtain a high as possible diagnostic yield of culture to detect multipledrug-resistant organisms. One patient presented with an acutely swollen, red joint mimicking septic arthritis. This is our experience in 10-15% of elbow and knee tuberculosis. We therefore routinely send synovium for histology and tuberculosis culture during arthrotomy for septic arthritis. All the patients in our study, except one with isolated calcaneal involvement, had joint involvement and synovitis with or without subchondral erosions. In the study by Dhillon and Nagi,11 21 of the 74 patients had isolated osseous (non-articular) lesions, mainly the calcaneus presenting as a well-defined lytic area in the region of the tuberosity. Lytic lesions of bone not involving the joint have a good prognosis. Synovitis and juxta-articular erosions however, may result in joint cartilage destruction and has a more guarded prognosis. The classifications or patterns of bone involvement described by Mittal, Gupta and Rastogi10 and Dhillon and Nagi11 do not relate to the prognosis. The Kerri and Martini classification is applicable in the ankle joint, but in the subtalar joint and midfoot the joint space at presentation can be difficult to quantify. The anatomical classification we used in this study therefore helps to determine the prognosis. In the ankle joint the Kerri and Martini classification is predictive of the outcome. The three ankle joints with a poor outcome had joint space narrowing at presentation. In the midfoot the functional outcome in this study was uniformly good, although the joint surfaces could not always be clearly defined. At presentation this was due the significant osteopaenia sometimes manifesting as 'absent' bones, and at follow-up Mittal et al10 describe it as a coalesced mass similar to the wrist in rheumatoid arthritis. The one poor result with subtalar involvement in this study had a 2-year history and a multi-drug-resistant organism. The duration of symptoms before treatment does not necessarily determine the outcome. Nine of the 24 patients (three ankle joint, three midfoot and two subtalar joint) with excellent and good results had a delay to treatment longer than 4 months, which was the median for this study. Two of the four patients with a poor result had a delay of less than 4 months. This supports our belief that in stage 1 and 2 disease there is a protective immunity which manifests as chronic synovitis, whereas in stage 3 and 4 disease there is a tissue-destroying hypersensitivity resulting in significant subchondral erosion, which is not necessarily duration-dependent.15-17 Differences in immune response attributable to genetic and environmental factors may explain why 84% of the ankle joints in the study by Martini, Adjrad and Daoud from Algeria9 present in stages 3 and 4, whereas 76.9% of the ankle joints in our study present in stages 1 and 2. An anatomical classification, combined with the Kerri and Martini classification for ankle joint involvement, is a good prognosticator of the outcome in foot and ankle tuberculosis in children. Joint space narrowing of the ankle joint at presentation is predictive of a poor outcome (3/13). Subtalar joint involvement in this study had a good outcome in four of five patients. Midfoot involvement has a good outcome (9/9). The content of this article is the sole work of the authors. No benefits in any form have been or are to be received from a commercial party related directly or indirectly to the subject of this article. This study has been approved by the University of Cape Town Research Ethics Committee REC REF 195/2010.